So we all hopped onto coaches this morning and headed into York city centre – not for a tourist trip but to attend the Sung Eucharist service in the fabulous Minster: a great Synod tradition. It gets us off site and probably help us pray better about the business. In previous years I have ducked out of this service and gone to the early service at Heslington Parish Church, then making a pilgrimage to the National Railway Museum. But now I am one of the two Pro-Prolocutors of the Canterbury House of Clergy I have to robe (ironic, after yesterday) and join the impressive procession, that begins with the choir, and ends with Archbishops Sentamu and Justin walking side by side. Somewhere in the middle is the small group of Synod officers, including me. You get a grandstand view of everything (except the preacher) and a great perspective on the impressive men, boys’ and girls’ choir. That’s not a bad price to pay for being overdressed on a hot morning. Jim Wallis was the preacher – and he was sharper and more focussed than he was yesterday. He made the most of his American persona by getting us all to say “Good Morning” back to him and raised a few laughs along the way as he reflected on passages from Isaiah, Romans and Matthew’s gospel. My lunchtime diversion was a fringe meeting to launch Catherine Fox’s new novel Sins and Omissions. Book launches can be fairly naff. This one started badly – an organisational mix-up meant there was food for Dr Fox and the publishers’ team, but not for the 20 or so of us who’d booked to attend. Jeremy ‘Paxman’ Fletcher was in charge and saved the day. We trooped off to the nearest campus restaurant, and collected some lunch on a tray. Then things improved. We trooped back and then sat munching while Catherine Fox read a hilarious extract from the book – a set of definitions of the various orders of ministry on the Church of England. Suffice it to say that in her version, priests can become Bishops only if they have what (in a family publication like this) I will call a male appendage… And then she read the opening chapter, an aerial tour of the (fictional) cathedral city of Lindchester and the undercurrents of life and gossip among its leading ecclesiastical figures. Interestingly, she wrote the novel as a weekly blog, facing a 7.00 pm Sunday deadline every week. Several of her avid blog-followers were there. It’s clearly an engaging way of reading, but a stressful way of writing – and she’s still working that way – see this blog for the latest. She said she was partly writing it with Trollope in mind (in the setting and the authorial voice). It struck me that she was also following Dickens, who (I believe) largely wrote his stuff as serials in monthly magazines. Her publisher once told her ‘you can write brilliant sentences’. It’s true, and like the others I queued up to buy my copy. Catherine Fox is a martial arts expert, lecturer in writing, deeply thoughtful and understanding of clergy life. She is also very good at making me laugh. One of her favourite church news-sheet typos is “Jesus said, ‘Get thee behind me, Stan’”. Give her a try. The build-up to tomorrow’s vote continues. The papers are going to be all over us. The Grauniad got an early start with a curiously-titled leader for Monday’s paper. 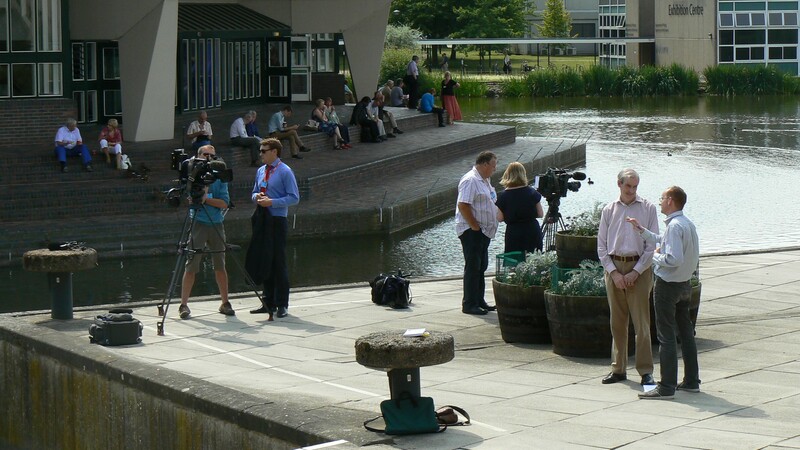 There’s been a steady trickle of TV crews and other journalists on campus, with leading lights in the debate being interviewed by the lake. I have found various people who have done interviews for their local BBC radio station for transmission this morning. I suspect if you go to your local stations website and ‘listen again’ to their Sunday morning show, you’ll find one or more of your Synod reps in there somewhere. It promises to be a right media circus tomorrow – TV cameras in the hall, interviews for breakfast and lunchtime programmes – and then the rush to air when the result is announced. In the meantime, people have been using the interlude between Friday’s debate and tomorrow’s decision to take stock. There are muted conversations by the lake, in the bars and around meal tables. But no controversy and little point-scoring. We have a lull. Will there be a storm? The conundrum is this: if they want it to go through, the logic is that they might vote Yes. But they say they will vote No. Now, where else would people vote against something they want to see happening? I wanted to understand why, given their personal theological integrity, they can’t simply abstain – not blocking the Measure, but not assenting to it either. It was a good conversation, and I could see it goes right to the core of my supper companion’s heart and spirituality. So I wonder if we might, tomorrow, hear some very personal apologia helping us to understand the dilemma some people are in. I don’t think we’ll be having a fierce ding-dong debate. I hope and pray we don’t get a repeat of the endless prepared speeches that we had last time. Honesty and humility might be the best tone. The Business Committee are very keen that Synod engages more with the outside world (meaning both people in the parishes and the general public). They are gently encouraging more blogging and tweeting, and if you follow #synod you’ll know there is a large community paying close attention to debates. Their comments are sometimes acerbic, often ill-informed, and sometimes very funny. But they are out there, interested, wanting to know what goes on, full of opinions and encouragement to prayer. Never more so than tomorrow, I think. 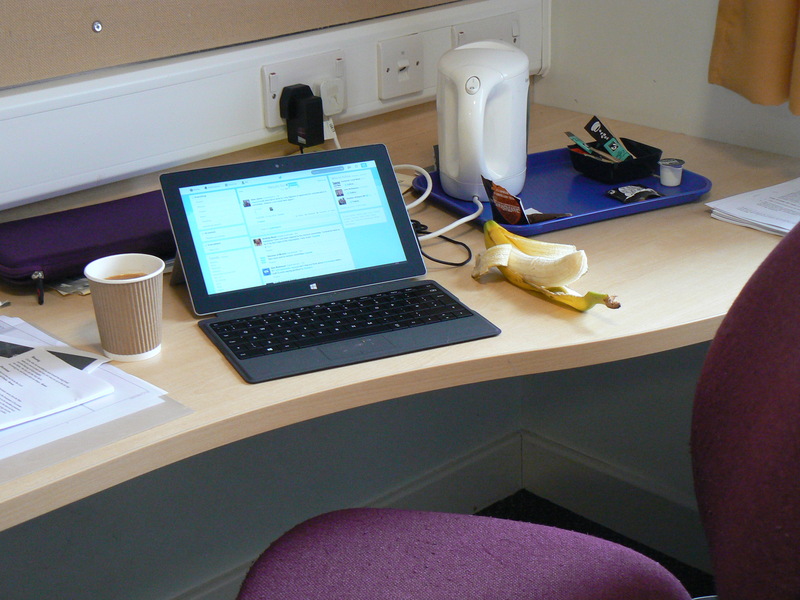 Coffee, tablet, banana – Bathwellschap’s blogging kit. 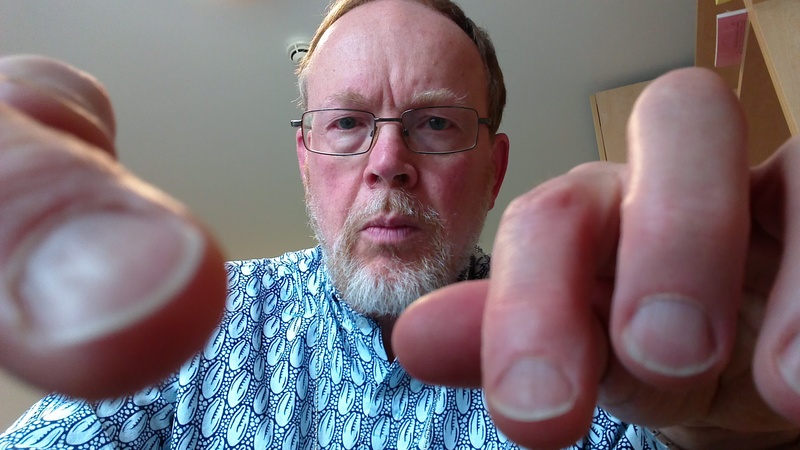 There’s also a reward for me: writing the blog helps me to process the vast amount of verbiage, prayer, gossip and mingling with significant people and trends in the church that all happen at Synod. Some people blog about their daily life. I would not do that – too boring, too confidential, and not enough time and space. But blogging about a specific set of events that happen three times a year is both achievable and fun. It’s a kind of para-journalism, I suppose. There’s a practical cost too. I can write text sitting in the main hall, or the bar or anywhere. But staying up late to tidy it up, proofread it, put in the links – and now pictures too – that takes till the small hours. This my reason for missing Baptism today – catching up on sleep! Tonight’s session with the Church Commissioners was thinly-attended. I think many people were glad to slope off to watch the football as a displacement activity. Everyone knows it’ll be a big day tomorrow. The saga of the Church Commissioners’ failed plan to move the Bishop of Bath and Wells residence out of the first floor apartment at the Bishop’s Palace came back to bite them during a Q&A session on their annual report. I wrote about the Synod’s previous engagement with this here and again here in February; and you can read how it all turned out here. What was interesting was amid the usual Commissioners’ financial stuff and queries about pay scales, three questions were asked about the implications of the Wells affair, asking for details of any plans by the Commissioners to change their way of dealing with dioceses over such matters. One was from a Bath & Wells rep – the others came from Southwark and Hereford. So the issue is still bothering people. But for now, all eyes are on the King’s Great Matter, which will be resolved, one way or the other, tomorrow. I’ll try to post coherent updates during the day. * I’m waiting for the day. The Beach Boys. Pet Sounds. Best album in history? 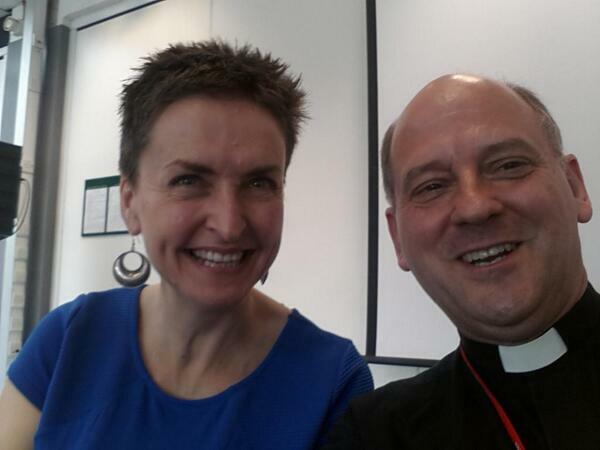 Image | This entry was posted in 2014: July - York, General Synod and tagged Church Commissioners, General Synod, Why blog?, women Bishops. Bookmark the permalink. Thanks once again for all this, Stephen. That last photo deserves a caption competition! Feel free… I’m not going after you for copyright!